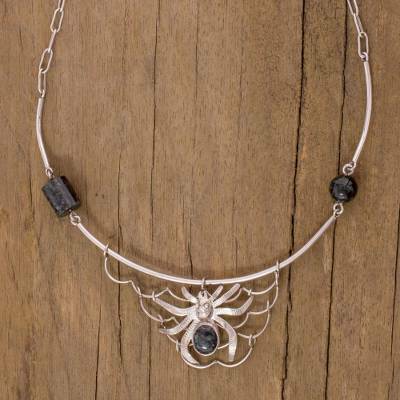 Dazzling in sterling splendor, a spider with a jade back is captivating in a handcrafted necklace. According to Maya cosmogony, the webs that connect the material and spiritual worlds are represented by K'at. From Rita de Catalán's "Maya Nahual" collection, this nahual is said to accompany a person through their spiritual life and connects them to the gods. "The web on this necklace symbolizes the force generated by all the possible ways we keep connected with each other. The cylindrical jade represents the sacred wand of the Mayas, and the globe represents the world," explains the Guatemalan designer. You can find jade pendant necklace 'Kat' by Rita Ramirez in jewelry categories such as Halloween Necklaces, Jade Necklaces, Silver Necklaces, Sterling Silver Necklaces and Pendant Necklaces. Enjoy exploring these sections for other Novica treasures. Rita Ramirez has received 2 microcredit loans with 0% interest from Kiva and Novica, the first for $500 and the most recent for $300. "What inspires me the most is nature with its flora and fauna, the beautiful sky over this country, the colors of the huipiles, the sun and stars, and the joy of being alive." "I love working in this craft, the feeling of being inspired, the act of transforming my ideas into a piece of jewelry, and the knowledge that each person will give its own interpretation of the piece. I love the challenge of waiting to see if clients like my designs and see them as a true work of art, and who feels beautiful when wearing it. "I've always worked for international financial entities and I've always loved jewelry. But never did I ever imagine I would end up designing jewelry! I always thought I wasn't made for art, but then the opportunity arose for me to take a six-month long jewelry design course, and from there I took other courses. I learned a lot and I met a lot of people who have contributed to this process, though I believe I still have more to learn. "I now have my own workshop and I would like continue learning more about designing and silverwork techniques so that eventually I could teach other women. "When I was five years old I went to live with my grandparents after my father passed away. Growing up I spent time in the city and in the countryside where my grandfather had a farm. I remember my childhood fondly, though the death of my grandmother was extremely painful – she was like a loving mom to me. However I continued with my life and my studies, on the way to becoming an accomplished person. "What inspires me the most is nature with its flora and fauna, the beautiful sky over this country, the colors of the huipiles (traditional clothes), the sun and stars, and the joy of being alive. "I love being able to convey a message through my designs that makes them something more than an accessory. I want each piece to be meaningful to the person wearing it. I enjoy reading a lot about the theme I'm designing. I get an idea, I analyze all the features it needs to convey a message, and I sketch and sketch until I have the design I like. Some pieces require a lot of time, some less. It's a real challenge to combine aesthetics with a message. "With each piece I create I'd like to convey the idea that we're all united under the same sky and we share the same air and land. Therefore, we are all interconnected by an invisible network that fills us with life and it is our mission, as human beings, to give our best and respect each other. "I dream with seeing my designs being acquired by people all over the world, and so they will get to know my country, the richness of its flora, fauna and culture. "I always believed I had no artistic talent since I had been working professionally in a very structured world. However, my daughters paint, my eldest plays the guitar and also loves making jewelry and so I realize now that it's something I've always had in me. "Thank you very much for the opportunity of sharing my designs and my country's culture!"